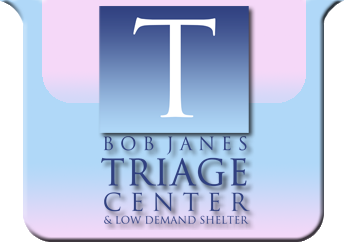 The goal of the Bob Janes Triage Center & Low Demand Shelter is to reduce the number of individuals with known mental illnesses or those with substance abuse, who are arrested and taken to Lee County jail for low-level, non- violent offenses. * Reducing the time that law enforcement officers interact with the individuals with the mental illness or substance abuse disorder. * Improving the outcomes for the individuals who tent to cycle through the criminal system by engaging them in treatment. The facility is operated as a multi-agency collaborative effort between SalusCare, Lee Memorial Health System, Lee County Human Services, local law enforcement and other additional vital partners. Individuals experiencing a behavioral health crisis who are at risk of being charged with a minor ordinance or non-violent offense (Such as Open Container, Disorderly Conduct, Disturbing the Peace, Loitering/Prowling, and Trespassing charges). Presenting problems include homelessness, substance abuse disorder, or a mental illness. Individuals can only be accepted by law enforcement during designated hours. Law enforcement officers must complete an information form upon arrival at the facility. The Triage Center/Low Demand Shelter isn’t a locked facility and can only accept individuals on a voluntary basis. The facility is not used in lieu of the Baker Act receiving facility. Individuals can be referred from area hospitals for suitability for placement by trained emergency room staff. The screening process includes a medical clearance for admittance into the Triage Center/Low Demand Shelter.